We did even better this month than last month, so that is pretty sweet! Of course, February was a short month and we only had four weeks of groceries. But we did better on not overbuying at the store this month. Forgot to take a picture. I was really disappointed with this load of groceries. It was expensive because I was buying a lot of the ingredients for our large get-together that I talk about below. Sodas, beer, wine, and other packaged ingredients are expensive. Plus a birthday cake that cost $19.99 (epic birthday cake purchase fail! BJ’s is so much cheaper!). Mr. ThreeYear went shopping this week. Although he spent a small amount of money, we ran out of a lot of food midway through the week. But, because we had so much food in our freezer and pantry, we were easily able to feed ourselves. It was a great lesson for us that even if we run out of fruits and veggies, we can still make delicious food that is healthy and nourishing. Mr. ThreeYear’s purchases from ever-cheap Market Basket. I have no picture to help me remember what I bought, but this week I did a good job buying snacks. I stocked up on pretzels, Pringles, cookie dough, and other treats for the boys. Sometimes if I buy too many fruits and veggies, I can forget foods that I can use to pack the boys’ lunches, and then I have to really scrounge to figure out what to pack them each day. But this week was a good balance between both. I was proud of myself this week. Under $100 and we bought a lot of good food. I even remembered to take a picture! As you can see, there’s little meat in this photo, which is probably why it was such an inexpensive haul. But lots of fruits and veggies, yogurt, local milk and half & half, coffee, ham, and snacks. Random trips to our local market or liquor store: 11. Total money spent there: $160.42. Ouch. We did worse than last month!! We’re going to try and do better (again) in March. We also spent $30 on local honey with our neighbors. Our ear/nose/throat doctor friend says local honey is one of the best things you can eat to manage allergies. We like to support our neighbors. Here are more random shots of the meals we ate during the month of February. We ate a lot of bread with cheese and ham this month. We also ate some frozen waffles and occasionally, on weekends, bacon, eggs, and pancakes (Junior ThreeYear even cooked them himself!). 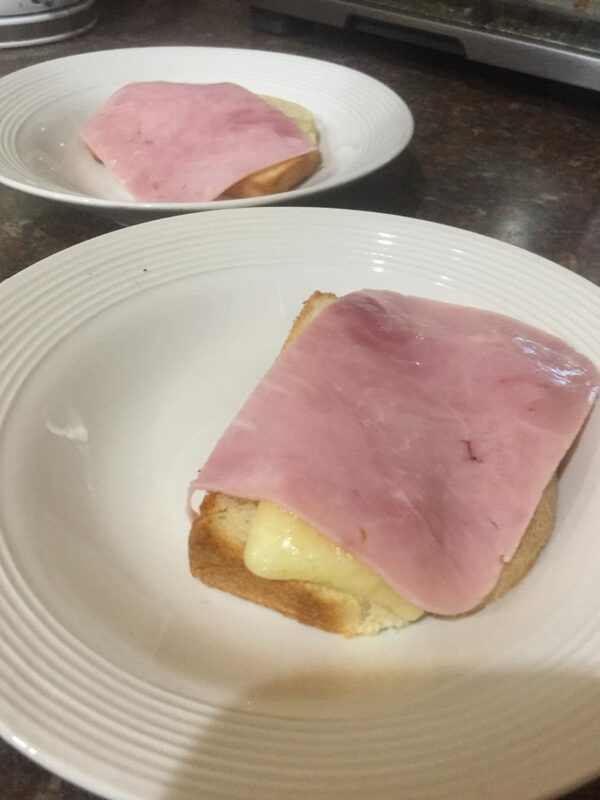 A typical breakfast of melted cheese and ham on toast. This month was the same as last in terms of lunches. I eat leftovers, the kids eat sandwiches, crackers and cheese, fruit, etc. One of these days I’ll remember to take pictures of their lunch boxes. 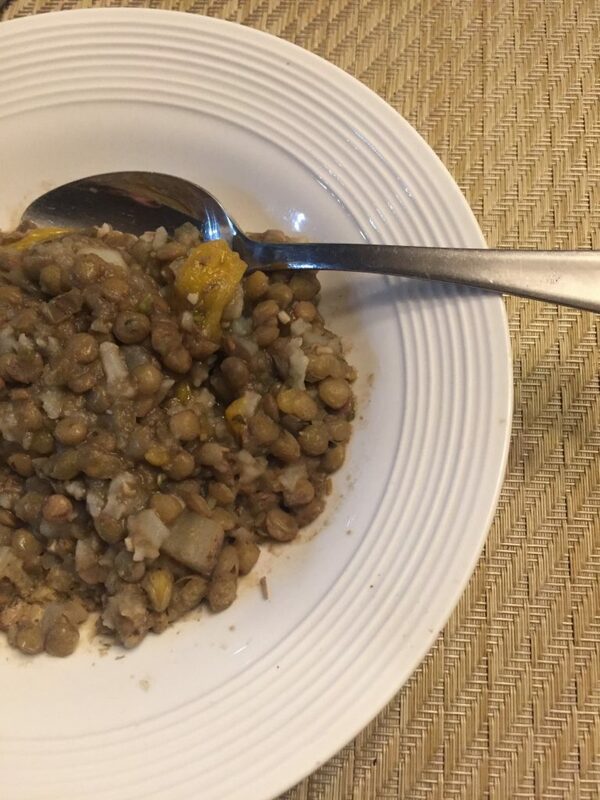 Leftover lentils for lunch (there’s your daily dose of alliteration!). We keep dinners very simple, because it’s easier and we have a picky eater (Little ThreeYear!). We have started having weekly tacos and lentils, because those are both meals that the little guy will eat. We also try to eat vegetarian at least once a week. That cuts down on our meat costs quite a bit (groceries are much more inexpensive with no meat!). Last night’s dinner of just veg (love how the Australians abbreviate veggies–but I think I failed in the usage a little). 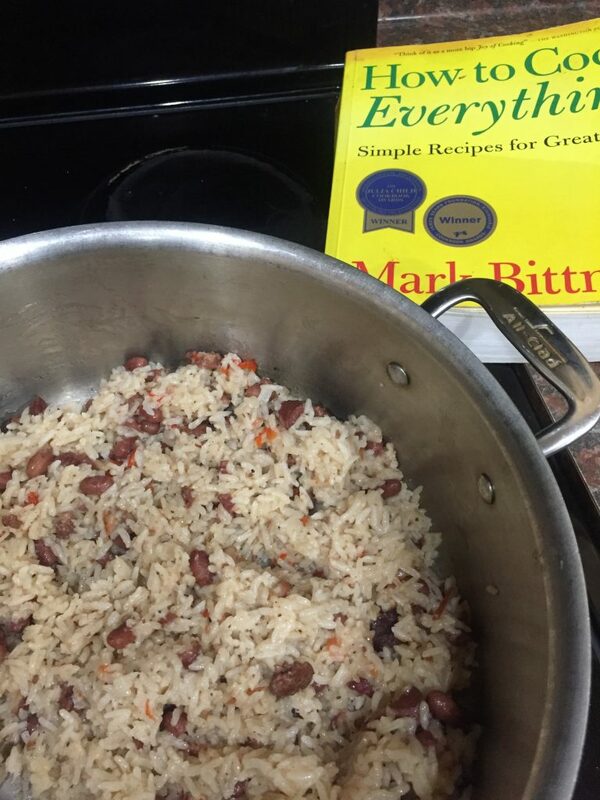 I made a big pot of red beans and then, using the red beans, made Mark Bittman’s absolutely delicious red beans and rice (hint: you use Coconut milk). His is the only cookbook I own, and everything I make from there is so good. But it’s rare I use a cookbook to make a meal, because I usually just throw whatever’s at hand into a pot. It took years to get there, though, and it started with me following recipes to teach myself how to cook. 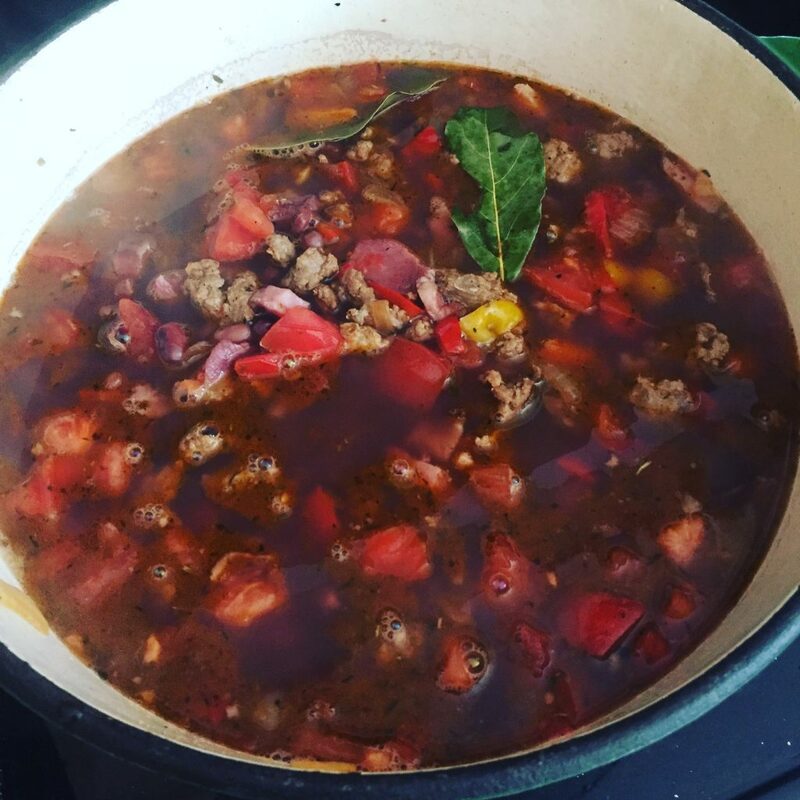 One bag of red beans, a ham hock, sausage, an onion, a red pepper, some bay leaves… okay, these are not simple to make but they are delicious! And the red beans and rice. They went fast! We had friends over a couple of times this month, once for Mr. ThreeYear’s birthday party, and once with a couple we’ve been trying to get together with for awhile. It is expensive to invite people over, especially when we had over 20 people for Mr. ThreeYear’s birthday! But we actually made a delicious, inexpensive meal that people loved. It was taken from Shauna Niequist’s Bread and Wine, and it is easy, cheap, and delicious, a combo that can’t be beat when you’re entertaining a large crowd–layered chicken enchiladas–check out the recipe here. To make it even easier, I use canned chicken (which you can buy next to the canned tuna). I served it with a big salad and lots of chips and salsa. It’s a casserole that you can make ahead and freeze. I quadrupled the recipe for 20 people and we had leftovers. We also had a delicious (and free!) meal at our church. We do a yearly “Fat Sunday” celebration to kick off Lent, and everyone brings in yummy Cajun food! I stuffed myself this year! The Fat Sunday decorations at our church. 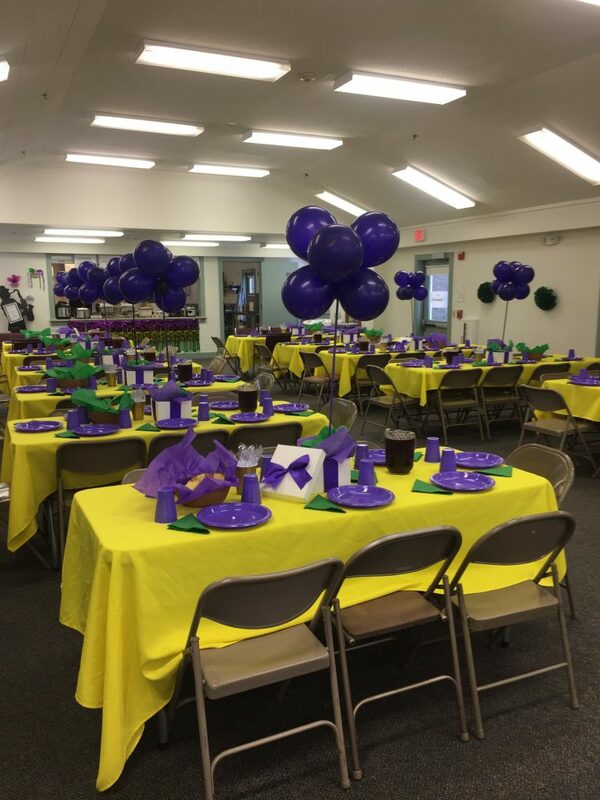 We have a lot of retirees in the congregation, and boy can they throw a shindig! Do whatever it takes to avoid the little trips to the store–having extra snacks on hand is a good idea! Do an inventory and make a simple meal plan before you make your grocery list. We did pretty well at shopping with a list in February, although I did go off-list a couple of times. I think the key takeaway from shopping with a list is that your shopping will only be as strong as your list. What does that mean? Mr. ThreeYear bought groceries a couple of times in February, based on a hastily-scrawled list I’d made. When he got back from the store, I saw that we were missing a lot of important staples and snacks, because I had not bothered to put those on the list. March’s focus is going to be Use Cash. We’re going to withdraw $350 every two weeks and see if we’re able to spend less and reduce our trips to our local market by carrying cash around. Mr. ThreeYear and I will each have an envelope with cash in it to spend on food. 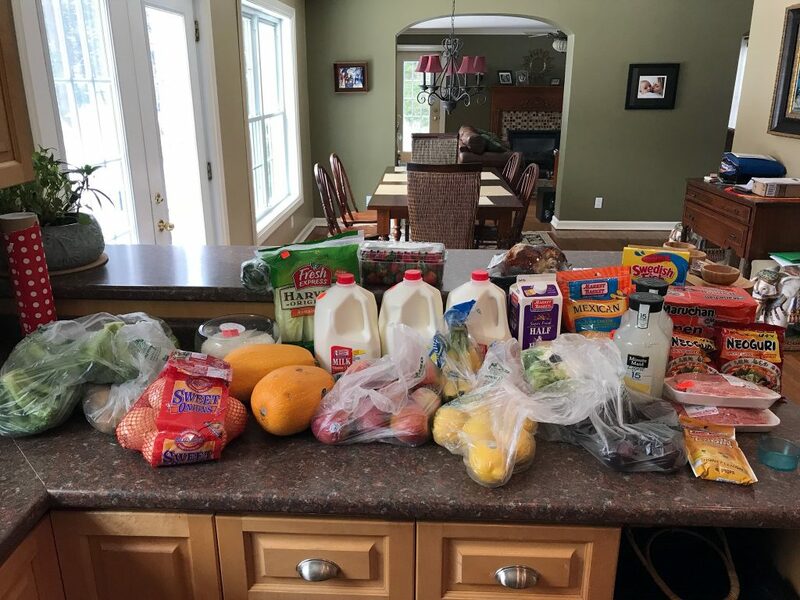 My hope is that handing over cash while grocery shopping will encourage us to be more mindful of how much we’re buying and mindful of those small trips to the local stores. March is a slightly longer month with five weeks! So it will be very tough to stay in budget, but we’re going to do everything we can to try. Again, we made way too many side trips to our local market, so if we can eliminate those, I think we’ll be okay. What were your biggest wins/fails for February, food-wise? Got any tips for us in March? We committed to not buying bread or eating out in Lent and it has been an awesome challenge! Mr. AR is making his sliced bread loaves and I started dabbling in sourdough (I’m such a newbie at this but it is fun to try!). You just made me so hungry!! Yum!! I like the idea of making all your bread from scratch. We could totally do that. I love making bread, but it does require a bit of a time commitment, so we have to make it a priority. When I send my hubby to the store I have to give him such a detailed list!! It throws us off our rhythm for sure. We are working on eating everything in our pantry and chest freezer since winter is nearing its end. That heloped keep our February grocery spending low! We still have more in there (mostly tomatoes and zucchini), so I got my crock pot of chili going before leaving for work. Mrs. Kiwi, I admire you eating through your chest freezer! I keep looking at the bags of frozen zucchini and what-not and ignoring it. 🙂 I need to start using my crock pot more. Any great sites you use for crock pot recipes? The little in between trips are what kill us as well. I did better in January than February on that as well, but still considerably better than in the past, so I’m still counting it as a win. I’m glad to hear I’m not the only one! Yes, it’s so hard to resist “running up to the store” to “pick up one or two things.” And our nearest big store in 20-25 minutes away. I’m going to experiment with having a stash of the typical things we run up to the store to buy–potato chips, soda, bread, pizza. 🙂 I’d love to hear how it goes for you in March!! That Bittman cookbook is my husband’s fave! We use it a lot. I love it because almost every recipe I look for is right there. When I was minimizing the house, it was the one cookbook I kept because it had everything!